IntraMAX Reviews - Does It Provide Health Benefits? Brought to you by Drucker Labs, the IntraMAX multivitamin liquid dietary supplement claims to support a wide variety of bodily systems while delivering other health benefits. 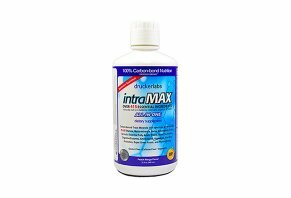 IntraMax is a supplement that promises to support the body’s ability to eliminate harmful substances, as well as for the endocrine, hormone, immune, circulatory, cognitive, and stress management systems. The supplement combines more than 415 ingredients into a liquid, peach mango-flavored dietary by using intraCELL cold-fill manufacturing technology. The website advertises this technology also allows the supplement's blend of vitamins, minerals, probiotics, antioxidants, fruits and vegetables, bioflavonoids, and amino acids to retain their maximum nutritional value. All you have to do, they say, is drink one fluid ounce of the liquid per day, six days per week, on an empty stomach. The Performance Protocol calls for one serving in the morning and another in the afternoon, at least 30 minutes before eating, while the Children’s Protocol (ages 4+) recommends one-half serving per day. Can you expect IntraMAX’s vast blend to deliver on the manufacturer’s claims? Are there any other supplements that advertise the same ones or contain similar formulations? Do you even need to take a supplement like this in the first place? Today we provide you with our review of the supplement to help you find actionable answers to your questions. Out of all of the dietary supplements the HighYa team has researched over the years, InstraMAX contains the most ingredients, by a wide margin. There are also 11 other matrices and proprietary blends contained in the multivitamin, comprising some 390 additional ingredients. According to sites like Examine.com, the Natural Medicines Database, and WebMD, many of IntraMAX’s standalone vitamins and minerals are essential for proper body function and optimal human health. For example, they tell us that riboflavin (vitamin B2) converts carbohydrates into the fuel source adenosine triphosphate (ATP), selenium aids in reproduction and the production of DNA, zinc is important for protein production and immune function, and potassium allows muscles to contract and regulates blood pressure, to name just a handful of random examples. However, they also indicate there's insufficient clinical evidence to suggest that the supplementation of these ingredients will deliver meaningful benefits in those who are otherwise healthy (i.e., those who aren't deficient). Because all of IntraMAX's remaining ingredients are parts of blends, there's no way for consumers to know exactly how much of each it contains. But with more than 400 total components, it appears that the concentration of each one is fairly low and well below the recommended daily intake. In some people (no dosages or other specifics listed), vitamin C might cause heartburn, riboflavin can cause the urine to turn a yellow-orange color, and niacin often leads to flushing (although at a much higher dose than what’s found in IntraMAX). Pyridoxine (vitamin B6) might cause loss of appetite, tingling, and sleepiness, taking iodine may lead to runny nose, and routine zinc supplementation might cause kidney and stomach damage, so it’s not recommended without the advice of a healthcare professional. Along these same lines, it's a wise idea to talk with your doctor any time you're thinking about taking a new dietary supplement, IntraMAX or otherwise. They can help you avoid side effects and medication interactions based on your individual diagnosis. We found IntraMAX sold through several popular online retailers at the time of our research, including the Global Healing Center, Amazon, and Pure Formulas. 32 oz bottles ranged between $80 and $90, while GHC also offered a 2 oz travel size for $7.99. Refund policies will vary by retailer, although if you have additional questions, you can reach a Drucker Labs representative at 888-881-2344, info@druckerlabs.com, or via the live chat tab on their website. What Are Customers Saying in Their Online Reviews? Between these same sites, we encountered nearly 1,000 combined customer reviews for the IntraMAX supplement, who had given it an overall average rating of about 4.7 stars. Most compliments referenced effective results (boosted energy, improved metabolism and mood, better-looking skin, etc. ), good taste, and no side effects, while complaints (what few there were) often cited no results and high price. Many Amazon complaints also indicated that their bottles were (sometimes far) past the expiration date, while more than one noted they received bottles with the date scratched off or covered over. How Can You Choose Between IntraMAX vs. Other Complex Multivitamin Formulas? In our “Do You Need to Take Vitamins or Dietary Supplements” article cited earlier, we explain that organizations like Nutrition.gov, Harvard Health, the American Cancer Association, and the American Diabetes Association (to name just a handful) suggest that non-deficient individuals do not need to take vitamins or dietary supplements. How to figure out if you’re deficient or otherwise in need of vitamin or mineral supplementation? Make an appointment with your doctor, who will order the appropriate tests (if necessary) and make a sound, science-based diagnosis according to the results. Why, exactly, you’re buying it? What evidence do you have for your beliefs? What are its known side effects and interactions? Is there a chance that it might do more harm than good? Based on what we learned from reviews on sites like Global Healing Center and Amazon.com, most online customers give both IntraMAX and Plano, Texas-based Drucker Labs high marks for efficacy and support. The company also seems confident that their supplement will work for the majority of consumers since most of the retailers they sell through offer at least 30-day refund policies. With these positives in mind, we learned earlier that sites like Examine.com and the Natural Medicines Database, as well as organizations like the National Institutes of Health and the American Cancer Association, indicate that otherwise healthy, non-deficient individuals likely don’t need to take a multivitamin supplement. Also, most of the standalone ingredients contained in IntraMAX are found in much lower dosages than the daily recommended allowance (when applicable), while nearly all of the supplement’s remaining ingredients are contained in different blends, so we can’t know exactly how much consumers are ingesting with each dose. This is why it’s important to have an in-depth discussion with your doctor before placing an order for any dietary supplement, who can help you better understand the real-world value you might achieve for the money. Write a Review for IntraMAX!